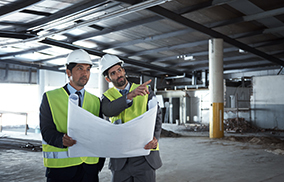 Ayerst Environmental Ltd provides a specialist range of CDM services to help our customers comply with their legal duties under the Construction (Design and Management) Regulations 2015. Firstly, the Client has a duty to make suitable arrangements for managing a project. Ayerst Environmental Ltd CDM Advisory service provides the Client with independent health and safety advice to supplement their own skills, knowledge and experience. As your CDM Advisor, Ayerst can also provide input on whether the other duty holders appointed have sufficient time and resources for the project. The Client also has a duty to make sure that relevant information is prepared and provided to other duty holders. If Ayerst is appointed as your Principal Designer, we can help and advise you on the collation of pre-construction information, and provide the information which designers and contractors need to carry out their duties. Whilst any external advisor cannot assume the legal duties, responsibilities and/or functions of the ‘Client’, some duty holders require independent health and safety advice to supplement their own skills, knowledge and experience. The procurement of specialist expertise to support the delivery of quality construction projects may be both necessary and effective, particularly in the short term while further expertise is developed within the Client’s organisation.